No Face Plate: Holy Mole. Yeah, I said it. Holy Mole. Yeah, I said it. How amazing is it that the oft-described-as Masterpiece of Mexican cuisine is traditionally vegan? Well, minus the stock. Which is easy to addend. Not only is it amazing. It is awesome too. You know I've been on this tamale kick. And as much as I adore that soy chorizo, I really wanted to do a filling from scratch. Like food-nerdy, raw ingredients only, all the way from scratch. So I figured I'd mess with my seitan recipe, try to "porkify" it a bit - a little fattier, smokier, some sweet notes. No sage, thyme, pepper, let the Mother of All Sauces handle all that. And ideally, I'd be able to shred it with a fork, as traditional pork tamales are made. Alas, that last part didn't happen. But the flavors were pretty damn amazing, if I do say so myself. I made a change from the last batch of masa I'd used, and it's an unhealthy one. Tamales, like most "peasant" food, are traditionally a catch-all for certain leftover materials, so lard is often used in the dough. I'd heard from a pal (and read on the innernets, of course) that veg shortening was a reasonable substitute, so that's what I used this time. Differences? Compared to corn oil, a key one - the masa was lighter, fluffier throughout, near pudding consistency. So good. Not like any of us need to be chowing down on hydrogenated oils but for a special treat, do try. If I had to pin down a few essential flavors for mole, they would be first smoke, then sweet, then spice. So everything you eventually throw into your blender needs to get a layer of char, first. You can do that with your gas stove or your broiler. But that means toasting almost every seed, every pepper, dry or no, every nut that goes down the hatch. Laborious, but worth it, trust me. Mix your dry ingredients thoroughly, and make a well in the center. Mix your wet ingredients in a measuring cup. Using a fork first, then your hands, slowly pour the wet into the dry, working the dough as you pour. When you've emptied all of the liquid, use both hands to knead the seitan for a few minutes, until it comes together, then roll it into a short, squat cylinder. In a wide pot, place your seitan (cut it into two pieces if need be) and pour your stock mixture over. Bring it all to a boil. Cover and simmer 1 hour. 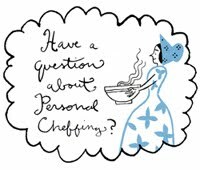 No cheesecloth here, dears! You want a lighter, less dense seitan. Also, putting the seitan in while the stock is cold gives it a better "crust" (thanks for the tip, PPK!). We'll come back to the final seitan prep once we have our mole done, giving the flavors time to blend. This is an alteration of a Chow recipe. The only two animal products they suggested using were pork stock and lard - they've been replaced with veggie stock and oil. I've also removed a couple steps and skipped any straining. Blend the sauce long enough, and it'll be super-smooth. In a dry skillet, toast your chilis until they have a bit of char on both sides. Set aside. Toast your sesame seeds, tossing, until they're a bit brown. Set aside. In a baking pan, put your tomatoes, onion, and garlic cloves. Broil 5 minutes, until they're all got a bit of char. Set aside. In your skillet, heat 2 tablespoons vegetable or olive oil. Saute your plantains until they soften a bit, two minutes per side. Set aside. Toast your thyme and oregano very gently in the same skillet, about 30 seconds. Set aside. Put your tomatoes, onion, garlic, seeds and nuts into a blender. Puree until smooth, about 2 minutes. With the motor running, add your chilis one at a time. How much stock you add here is up to you - you want to maintain as thick a consistency as possible while keeping the blender running, so add a little bit at a time until your sauce is moving again. Add your herbs, the plantain, and the tortilla, and blend until the texture is very smooth, about 5 minutes - there will still be tiny bumps, but they'll be very small. Heat the remaining oil in your skillet and pour in the contents of the blender. Saute until fragrant, about 5 minutes. Add your chocolate and stir until it blends in completely. Taste for salt and sweet, adding either sugar or salt until you're satisfied. With a whisk or hand blender, beat the shortening until it's fluffy. You could also use a stand mixer here, if you have one, with the paddle attatchments. Using a fork, mix the masa, salt and baking powder. Make a well in the center. Slowly add your stock while mixing with your fork, continuing to work the batter until it's uniform. It'll be pretty wet, no worries! While continuing to beat the shortening with your mixer or whisk, add the wet masa by handfuls until you've emptied your bowl. Beat on low until everything's well blended. The dough will be a little wet and very spongey. Set aside. Slice your seitan into 1/4 inch wide strips and drain on a paper towel. In a large bowl, toss the seitan with about 1/3 - 1/2 cup flour, evenly coating the strips. The flour coating will give your faux-pork an awesome crust. Heat enough oil in a skillet to cover the bottom of the pan. Add your seitan in batches (took me 3) and fry until browned on each side, about 3 minutes. Drain, again, on paper towels. Chop your strips roughly, into pieces less than an inch long. Mix your chopped seitan with the entire batch of mole in a bowl and set aside. Dexterity and a hungry belly! Tear 3-4 husks into strips to tie your tamales with. You'll need 20-25. Flatten a husk on a cutting board and using your hands, grab 1/2 cup masa. Smooth it into a rectangle in the upper-center of the husk. Press about 1/4-1/3 cup mole into the center of the masa, and using the sides of the husk, roll the filling into a package. Then roll the husk around the package, fold up the bottom and tie it with a strip of husk. Here's that pictoral how-to from last time. Set upright in your steamer or pot. 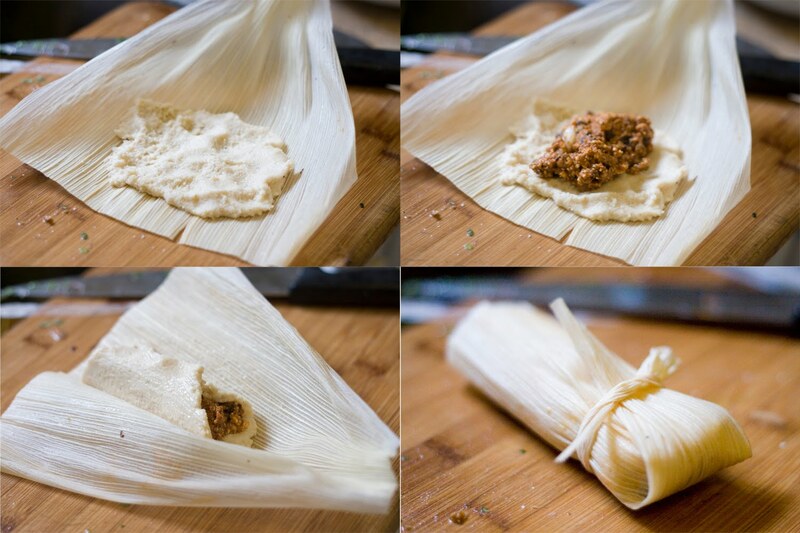 Repeat until you've made 20-24 small tamales. Cover with remaining husks and lid. These cook for about the same amount of time as the previous batch I told you about, but will look a little softer when they're finished. They are amazing. Enjoy them with a little soy sour cream or salsa, or plain, if you can even call a mole tamale that. Viva el Tamale!